Chrysler’s Sebring Convertible continues to be America’s best-selling convertible. Its styling lends a European elegance that doesn’t seem to grow old. It’s one of the roomiest convertibles available, with plenty of legroom for four to travel in comfort. Putting the top up or down is a press of a button. So it’s not hard to see why the Sebring Convertible still outsells such venerable ragtops as the Mustang and Camaro. Dozens of refinements have been added to the Sebring Convertible in the past few years. For 2000, Chrysler has reworked the sound insulation package throughout the car re-tuned the rear suspension to improve ride quality. Three models are available: JX, JXi and JXi Limited. They all come with Chrysler’s 2.5-liter V6 engine and automatic transmission. Together, these three models command nearly a third of the convertible market. It doesn’t seem fair to describe the entry-level JX as a base model, because it comes standard with cruise control, power everything and many amenities – though not as many as the generously appointed JXi and JXi Limited. The JX is priced at $24,790, the JXi at $27,105 and the JXi Limited at $28,995 (including $545 destination charge). We drove the top-line JXi Limited, which was painted an elegant bright silver metallic clear coat–one of the new colors for 2000. Other new colors are black, shale green metallic and taupe frost metallic. The Sebring Convertible’s nicely sculpted lines give it an eye-catching, but dignified, European look that’s distinctly different from the Sebring Coupe. The Convertible’s narrow, self-contained grille, along with its contoured, gently sloping hood add to its confident air. That this car still looks elegant and contemporary after four years is a testament to the soundness of its design. One important touch is that the Convertible’s firmly mounted retractable top is a snug, tight fit. For a convertible, the Sebring offers impressive trunk space–enough room for six shopping bags and a medium-sized suitcase. Our JXi Limited started at $28,995, including the $545 destination charge. There’s really nothing quite like the Sebring Convertible on the market and comparing it to the Ford Mustang is like comparing a symphony concert to a rock show. A Mustang GT convertible goes for about $26,000, but it’s a smaller car. A beefy V8 engine powers the Mustang GT, while the Sebring employs a V6. The Sebring JXi Limited offers a long list of luxury amenities as standard equipment, such as rose zebrano wood grain interior trim and a choice of two-tone agate and camel or solid agate interior, both of which come with perforated leather seats and padded console armrest. Other standard items on the Limited include low-speed traction control, AutoStick transmission, universal garage door opener, leather-wrapped steering wheel, shift knob and parking-brake lever, automatic day/night mirror, four-wheel anti-lock disc brakes, and chrome-plated cast aluminum wheels. Out test model came with an optional premium 6-disc CD changer ($160), which boosted the total price up to $29,155. The JXi comes with 16-inch aluminum wheels with P215/55R16 Michelin XGT4 tires, which means you get tighter cornering response and braking performance than you’d get with the standard 15-inch steel wheels and P205/65R15 Michelin MX4 tires that come on the JX. Our Sebring Convertible came with a nice leather interior. The higher-end JXi and JXi Limited come with the more up-market fabric top in place of the JX model’s vinyl top. But whatever the material, the top’s ease of operation is a definite selling point. Thanks to the driver-friendly mentality of Chrysler’s engineers, we are spared the aggravation of having to slog through an owner’s manual. All you have to do is snap open two windshield latches, press a button and the top whirs into action, lowering in less than 10 seconds. Then, the lowered top can be hidden away under a boot that fastens shut with snappy Velcro tabs. The whole process only takes a minute. If you’re sitting at a stoplight when a downpour–or even a sprinkle–comes from out of nowhere, you can swiftly raise the roof with the push of a button. When the top is raised, the front windows automatically slide down a few inches allowing them to seat themselves with the top. Snap the latches back into place, flip on the wipers, and you’re ready to ride the storm out. The rear window is glass, which is preferable to plastic, and a defroster is standard. Like many convertibles, over-the-shoulder visibility is reduced when the top is up. Out front, the Sebring’s smart windshield design provides unblocked sight lines in all directions. The doors are a bit long–a fact of life with most two-door vehicles–so make sure you have enough space on either side when you park. Unlike some convertibles, the Sebring ragtop can easily accommodate four full-size humans. The seats are supportive and quite comfortable. The height-adjustable seatbelts provide a snug, comfy fit for drivers of all heights. One touch we really liked: The belts are integrated into the back of the front bucket seats, so rear passengers won’t get tangled up in them when getting in and out of the back seat. But the rear seats are so comfy, with such ample space, that those rear-seat passengers might never want to get out–not even on a long trip. A tad more rear shoulder room would make it even more comfortable. The Sebring Convertible boasts a big trunk, an important feature when traveling or driving home from the airport. The instrument panel is easy to read, with large dials and digits. White-faced gauges add sports appeal. Audio and climate controls and other switchgear are just as easy to reach, and ergonomically smart. Our JXi Limited test model had leather seats–with perforated inserts-as standard equipment, while the JX models come with a standard vinyl interior. When we drove the Sebring Convertible this past summer, Chrysler had purposely left a Beach Boys CD in the stereo. Put down the top, plug in the tunes and the wind flowing over the windshield blows all your cares away. You’re instantly in a good mood. The V6 engine provides plenty of muscle when you punch the pedal. It fades a bit at higher rpm, however, taking more than 10 seconds to accelerate from 0 to 60 mph. So the Sebring isn’t exactly a high-performance road machine. But its V6 propels it quickly in critical passing situations. And there’s plenty of torque for freeway driving or cruising around town. When we drove the 1999 model, we noted that the engine is noisy under hard acceleration. We also noted a fair amount of road noise, which is not unusual for convertibles. For 2000, Chrysler has taken steps to reduce noise inside the cabin, such as new wheelhouse silencers, a foam backing for the convertible top, additional silencing in the rear seat and added trunk bulkhead material. At times, the automatic transmission didn’t respond as quickly as we’d like. Using the AutoStick transmission that comes on the Limited model helps address this. Here’s how it works: Move the shift lever into the semi-automatic mode and you can manually downshift a gear or two. This improves control by allowing you to keep the engine in the power band for coming out of corners or passing maneuvers. It’s also more fun–a valuable commodity in a convertible. The power-assisted rack-and-pinion steering responds with precision and poise. All Sebring Convertible suspensions employ unequal length upper and lower control arms and coil springs front and rear. Last summer, we noted that bumps and road vibration is transmitted into the cockpit. The suspension is soft and the car leans a bit in corners, but the handling is predictable making this an easy car to drive. The four-wheel disc brakes with ABS, which are standard on the JXi Limited, were sure and firm, with no fading or grabbing. It’s very stable in panic-type stops. The JX and JXi come standard with front disc and rear drum brakes with ABS. 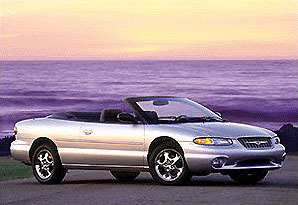 Chrysler’s Sebring Convertible is an enjoyable car when cruising with the top down and the wind in your hair. It comes with an attractive, comfortable interior and Chrysler has managed to eliminate much of the excessive wind buffeting that was once part of the convertible experience. Roomy back seats and a big trunk make this one of most practical convertibles on the market and its elegant styling has stood the test of time. Head/hip/leg room, f: 38.7/52.4/42.4 in. Head/hip/leg room, r: 37.0/44.7/35.2 in. Cargo volume: 11.3 cu. ft.